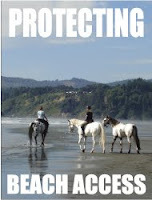 The coastal protection that the European Beach grass was intended to provide has been very effective. High dunes created over the last 100 or so years by the non native beach grass and the supported subsequent wetlands had established a formidable barrier against ocean storm incursions and tsunamis. FEMA guidelines strongly advise against removing vegetation from fore dunes for a reason. 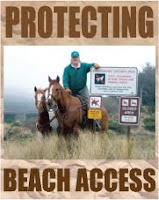 The Coastal Commission does not permit coastal development on areas with less than a 30 foot elevation yet have allowed through their coastal development permits lowering of our primary dunes, most of them already under 30 feet. Sea level rise is either relative or not. We cannot have it both ways. Wetlands act as a type of bumper against large ocean effects and also provides a relatively stable lifeline for trees and a diversity of native plants and animals. When the sand is set in motion by removing vegetation, native plants often have great difficulty taking hold and dunes diminish considerably in height. Vacant windblown sand becomes sterile and the critical microbial crust dies. A recent University of Oregon study looked at the effects of the changes in dune topography from beach grass removal and from vegetation succession from one type of beach grass to another. This study found that fore dune height was often related to the type of grass on it. The European beach grass tended to create the tallest dune, the encroaching non-native American beach grass shortened the dune by almost half. The native grass called elymus mollis produces a much lower and sparse dune in comparison. In this study it showed not only did the European beach grass provide the highest level of coastal protection but it also provided significant shelter for native plants. It is easy to see locally in some of these areas where the beach grass has been removed and now only has fast moving and relatively plant free sand. Whereas behind a beach grass protected dune there is a vast diversity of native plants, wetlands and wildlife. Had we known that removing vegetation from our primary dunes would have such unintended consequences we never would have done it. Never would have been allowed to as much as we enjoy some of the wild flowers. These effects were not included in permit applications. The Coastal Commission and the county planning department have been aware of these problems but are in an awkward position. Some of their staff are directors at Friends of the Dunes, a local non profit and high profile advocate for beach grass removal. Both the county and the Coastal Commission acknowledge that there have been unintended consequences related to these projects but perhaps like most of us they also assumed these “restoration“ projects were nothing but beneficial. However they are also aware of a 2007 signed geological report that predicted the dune wasting process that is now in progress. Not only are the natural wildlife habitats hit hard but the main water line, transmission towers, homes and roads along the Samoa peninsula are left very vulnerable. If the dieing forest at Lamphere dunes foretells what is to come of other back dunes we are in trouble. The White Paper promised at the last Dune Forum meeting over two years ago is still a no show. The snowy plover 5 year review is also 2 years over due. There were a lot of unanswered questions back then and there are a whole lot more now. Those that have taken our public monies and have effected our public lands need to step up take responsibility and answer the ever growing concerns. It may be a little embarrassing to some proponents of these past practices and we will have some repair work to do but it is not going to get any easier the longer we wait. The permits related to these projects need to be red flagged immediately while we review these efforts in a transparent way. Meanwhile strategically placing temporary sand drift fencing until adequate beach grass recovery is made could buy us a little time.